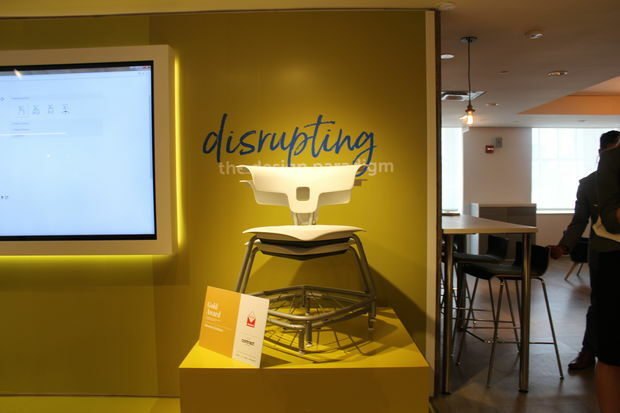 DOWNTOWN — With furniture featuring orthogonal shapes or chairs aligned in a snakelike placement, NeoCon is showing off some of the latest ways companies are re-creating the workplace — and some say offices could become a lot more like college campuses. NeoCon, an interior design trade show, is taking place at the Merchandise Mart, 222 Merchandise Mart Plaza, through Wednesday. Open to the public, the showcase event highlights commercial designs and business trends. One of the expositions showcased the work of KI, a Green Bay-Wis., contract furniture company that has created offices that resemble workspaces on college campuses. KI designed the Ruckus, a seat that lets you sit, stand or even slouch at your convenience as a way to allow business to adapt to evolving workspaces. 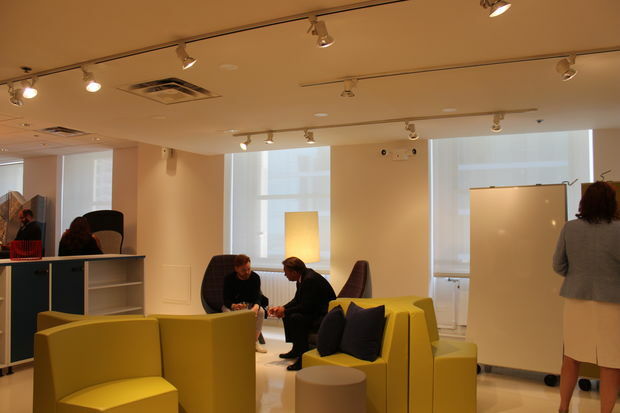 Some of the furniture's features allow people to create a "flimsy space," which allows companies to move pieces around to create a personalized workplace. Jonathan Webb, vice president of workplace strategy at KI, says that creating space for interaction is the main priority. "These environments are meant for individuals to be able to work, have social interaction and on a continuous basis," Webb said. "[And] to do so without interruption and allow them to adapt to the work styles that are in at the moment." Research done by KI on college campuses showed that students "don't necessarily sit in a proper way," Webb said. For that, DIY styles are in with the "MyPlace Collection," where you can arrange and rearrange pieces of lounge furniture for the best interactive experience. "We need to accommodate different work styles so that different people can work and train," Webb said. 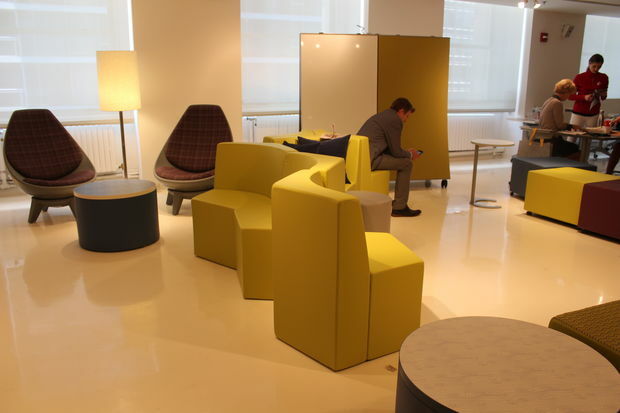 At NeoCon, attendees are free to try out different activities throughout the showroom, which provides mock-ups of a "maker's space." Such a space is designed to allow co-workers to come together, separate and go back and forth between the two. "A maker's space like this allows students to maximize their creative output and that is something that any organization can learn," Webb said. 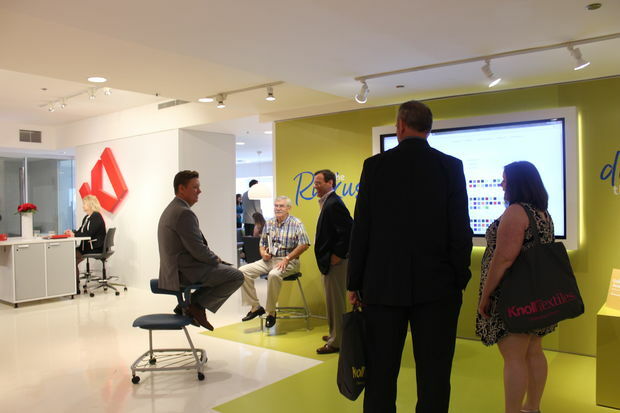 Marvella Jones, a designer at Memphis-based Office Interiors, came to check out new designs at NeoCon. "I think it's great. It's well going with the trend of innovative and open space," Jones said. "The industry is going that way, so it's interesting to see what people do to meet that criteria." 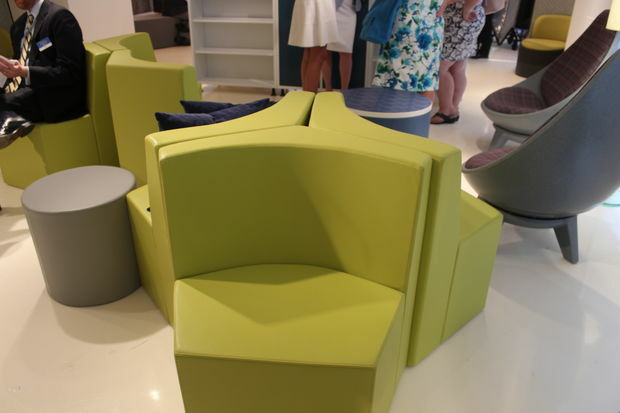 KI's collection will be available to test out at NeoCon until Wednesday.